This January, IDW Publishing will helm Infestation, a company-wide crossover featuring IDW's licensed Hollywood properties and undead invaders from Chris Ryall and Ashley Wood's series Zombie vs. Robots. We talked to Ryall about these pandimensional zombie invaders. Infestation begins in January and continues into IDW's Ghostbusters, G.I. Joe, Star Trek, and Transformers series. 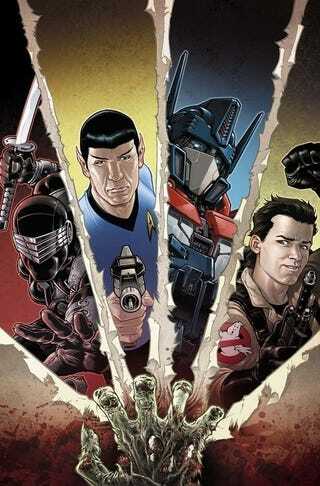 Although we won't see Egon and Optimus Prime hanging out with Spock and Snake Eyes, we will see the characters from the various titles encounter the same dimension-hopping zombie virus. The series kicks off with Infestation 1 by Dan Abnett and Andy Lanning and then branches off into the "infected" properties. At the IDW Infestation panel at the New York Comic Con, IDW's Chief Creative Officer Chris Ryall filled io9 in on this series. Where did the idea to unite these titles in a common crossover come from? I've been wanting to do this since we took on all these big properties. I wanted to find a way to get all the characters together, but they're four very distinct properties. It's hard to get universes that are owned by different people to interact. I started thinking about the things we had in place, namely the inter-dimensional plot points of Zombies vs. Robots. Over the process of six to nine months, we won the various parties over to the idea. During the IDW presentation, you mentioned that a zombie Stay Puft Marshmallow Man would appear in the Ghostbusters book. Will we see any zombified counterparts from the other universes? A zombie Destro, mayhaps? We won't be zombifying too many of the characters, but trust that some familiar faces will go through some changes. How are you going to bring the plot back together at the end? We will bring it back to a main Infestation storyline, and we will see some repercussions in the books, particularly the Transformers books. They won't be carrying on the zombie theme afterwards, but there will be consequences for these titles. INFESTATION #1: January 19, 2011. TRANSFORMERS: INFESTATION #1 and #2: February 2 and 16, 2011. STAR TREK: INFESTATION #1 and #2: February 9 and 23, 2011. G.I. JOE: INFESTATION #1 and #2: March 2 and 16, 2011. GHOSTBUSTERS: INFESTATION #1 and #2: March 9 and 23, 2011. INFESTATION #2: April 6, 2011.